Someone I know, (I’ll protect the guilty and no it was not Cynthia) mentioned the word pizza and suggested that I could just eat the toppings. If I’m going to order pizza, I’m going to eat the crust and all the toppings. Now, I’m really craving a pizza so, my challenge this weekend was to answer the craving, but stay within my lifestyle. I recalled a picture that I had seen a while back where a portabella mushroom was used instead of a pizza crust. While I was at Sam’s Club, I found a pre-packaged pack of 4 portabella caps for almost $5.00. The one downside that I learned about these was that I could not see what the bottom of the caps looked like and therefore some of the flat caps did not hold all the toppings as well. Also, I’m starting to think that I might have an issue with lactose so, I picked up an expensive bag of Daiya Mozzarella Style Shreads from Publix. I should have paid more attention to the ingredients as it’s not as great as I thought. Regular Mozzarella might have been a better option. At Walmart, I found a White Pizza Sauce that was only 1 carb per serving. For the toppings you can get as simple or complex as you would like. I stuck with the basics of cheese, spinach, and grilled chicken. The recipe is really simple! Remove stems from caps if required. Place mushroom caps on a cookie sheet, smooth side down. Bake for 10 minutes. Remove from oven and soak up any excess moisture inside the mushroom caps with a paper towel. Add desired amount of toppings of your choosing. Return the mushrooms to the oven and cook for 10 minutes. Serve Hot. 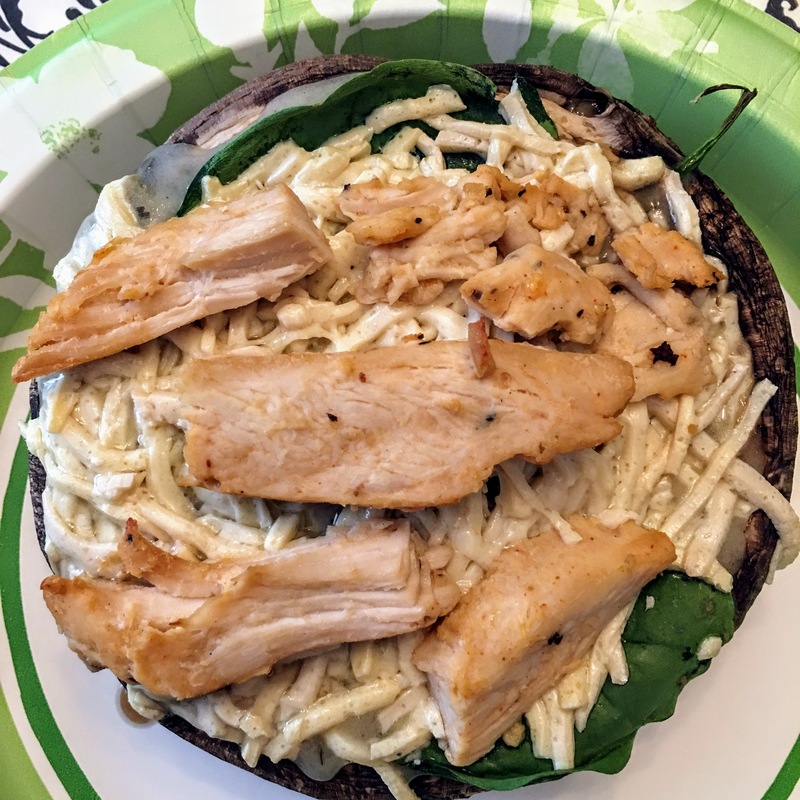 This entry was posted in Recipes and tagged cheese, Health, low carb, mushroom, pizza, portabella, recipe by kenyonsjourney. Bookmark the permalink.